Note : SUPERHYPERCUBE has been released by Kokoromi for PSVR, I did not work on this version at all, but this article shows its development history. 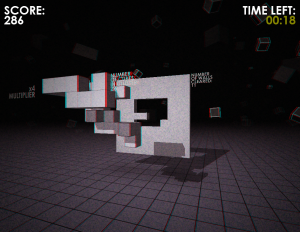 Super HYPERCUBE (capitalization may vary) is a game I made with the fine folks at Kokoromi for this year’s (2008) Gamma art/game show in Montréal. 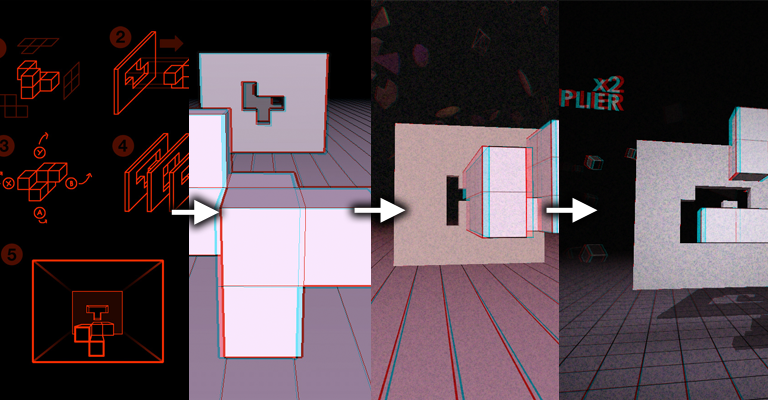 Gamma is a themed game party that’s been happening for three years now, each year with a design constraint for all the games that apply; this year’s Gamma 3D was about red/cyan stereoscopy aka color anaglyphs. 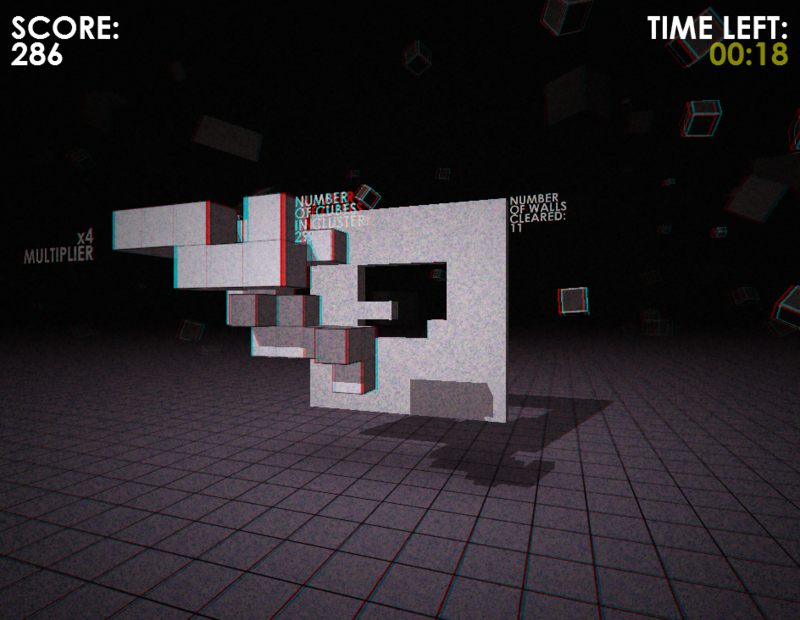 SHC Logo/Splash Screen : It’s actually all 3D and animated. The idea is that you have to fit a cluster of cubes inside a wall that represents a projection of that cube on one of its faces, with a series of rotations applied. So it’s a bit like the Japanese “Human Tetris” game shows, which is the comparison that our recent blog coverage have been using, and it’s exactly right. Except you’re handling a random cluster of cubes. Development Timeline : From concept art, to Sketchup mockup, to early prototype, to final product! Good Luck With That : The shapes get pretty crazy in the last moments. You can still use an Xbox 360 gamepad or just the keyboard to play it, and that’s how I’ve been testing it most of the time. It’s just nowhere as immersive without the headtracking… the combination of that and stereoscopy worked really well for us. There will probably be videos of people playing at Gamma 3D sometime soon, I’ll update this post with links. Here’s a photo taken by my friend Matthew, of someone playing SHC with the LED-mounted glasses! Aaaand Infinite Ammo just posted video footage of SHC @ Gamma 3D with many other Gamma games like the delicious Paper Moon and Fireflies! Also an epic dance routine. A handful of additional shots of Super HYPERCUBE at Gamma 3D, including me playing it (and clearly enjoying myself)! Thanks to Ivan “Toastie” Safrin for the pics. You will need the .NET 3.5 SP1 framework installed, and TV3D requires some oft-missing DirectX DLLs which you can get with the End-User Runtimes. I have to say that the Wiimote headtracking technology is all thanks to Johnny Chung Lee‘s inspiring work on the subject (and free code! ), as well as Brian Peek’s C# Wiimote library without which this would have never happened.